Blue Origin, the spaceflight company started by Amazon founder Jeff Bezos, will manufacture their BE-4 engine in a state-of-the art production facility to be built in Alabama’s Rocket City. The new facility will be in Cummings Research Park, the nation’s second-largest research park, and construction can begin once an engine production contract with United Launch Alliance (ULA) is awarded. According to the company, the BE-4 is America’s next rocket engine and will power ULA’s Vulcan rocket — if the Blue Origin engine is selected for the project. The production of this engine would end the nation’s dependence on Russia for access to space for critical national security space systems. The official Blue Origin engine manufacturing announcement event. Blue Origin will employ as many as 342 people in this new facility. The company’s capital investment will be approximately $200 million. 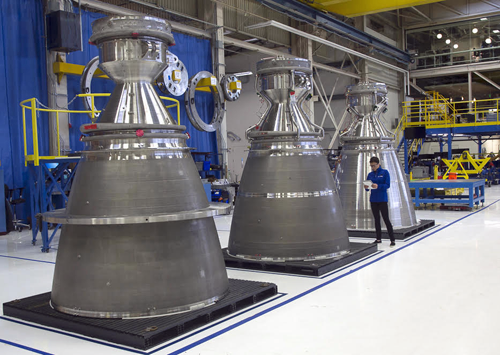 Two BE-4s would be used on the Vulcan booster rocket, which will also power Blue Origin’s New Glenn reusable launch system, with seven BE-4s on the reusable first stage and a vacuum-optimized BE-4U on the second stage. Blue Origin awaits the final public approval processes of the local package by the city and county governments during July meetings. Using the latest design and manufacturing techniques, the BE-4 is made for commercial and government missions. The BE-4 uses oxygen-rich staged combustion of liquid oxygen and liquefied natural gas to produce 550,000 pounds of thrust. Development of the BE-4 began in 2011. Testing of the BE-4 is currently under way. Many economic development partners contributed to the effort to successfully recruit Blue Origin to the state as part of what was called “Project Eagle.” These partners include the Governor’s Office, the Alabama Department of Commerce, the Tennessee Valley Authority, the City of Huntsville, Madison County and the Huntsville/Madison County Chamber. Blue Origin stated Huntsville was selected for this project due to the area's high-tech aerospace manufacturing workforce and ecosystem, including NASA’s Marshall Space Flight Center, nearly 300 private aerospace and defense contractors, and the University of Alabama in Huntsville, number 14th in NASA research funding in the nation. 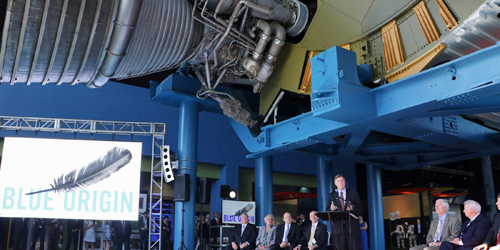 According to Robert Meyerson, the President of Blue Origin, Alabama is a great state for aerospace manufacturing and the company is proud to produce America’s next rocket engine rin Rocket City. The area’s skilled workforce and leading role in rocket propulsion development make Huntsville the ideal location for this state-of-the-art manufacturing facility. Huntsville is a hub of innovation in every facet of aerospace, making it the perfect home for this Blue Origin facility. In support of Blue Origin, the City of Huntsville, City of Madison, and Madison County have provided funding for their three school systems to launch an experiment on a Blue Origin rocket in summer 2018. The school systems will determine how to select teams and then they will work with the Huntsville/Madison County Chamber and Dream Up, an organization that supports space-based learning, to design and develop their payload.